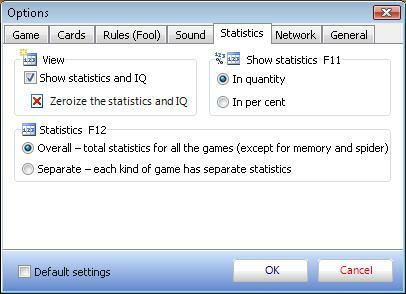 All the games have their own statistics. The program may have the overall statistics or the certain different for each game. The overall stats is gathered for all of the games, summing up the wins and losses in all the games. Separate stats is the statistic of a certain game. On ticking the "Clear the statistics" field all the statistic data is zeroized. You can win, lose or play in a draw against the computer not more than 10000 times. In case you won, lost or played in a draw against the computer for 10000 times the stats gets zeroized. You can switch this option off as well.